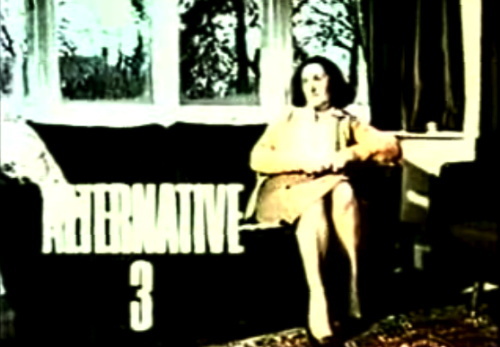 On June 20, 1977, ITV in England broadcast a documentary titled Alternative 3. 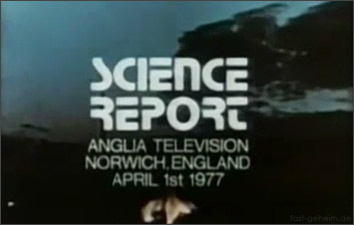 The show, presented as part of a regular series called 'Science Report' produced by Anglia TV, began with the announcer explaining that they had originally intended to broadcast a far different show, but something had gone wrong. They had intended to air a show about the British 'brain-drain', about how British scientists were leaving the country to find higher-paying jobs abroad, but in the course of their investigation they discovered that many of the scientists they sought to interview weren't just leaving the country. They appeared to be mysteriously disappearing from the face of the Earth itself. Alternative 3 — to establish a "Noah's Ark" colony of humanity's best and brightest off of the planet, preferably on Mars. The reality of the looming crisis had prompted high-level officials in the American and Soviet governments to collaborate in order to make Alternative 3 a reality. Through interviews with supposed astronauts and scientists, the documentary pieced together evidence that supposedly revealed that the Soviets and Americans, working together, had reached Mars as early as 1961, that the Apollo Space Program had been nothing but a publicity decoy to conceal the true purpose behind NASA's numerous rocket launches, and that scientists were now being abducted to work on Mars. The stony-faced earnestness of the announcer convinced many that the documentary was real because after the show's conclusion Anglia TV was flooded with calls. If viewers had watched a little more closely, however, they would have seen that the copyright notice for the show was dated April 1April Fool's Day (even though the show wasn't broadcast on April 1st). The closing credits for Alternative 3. A few were so convinced by the show that they refused to believe it wasn't real, even after its producers announced that the entire thing had been a joke. These faithful few continue to insist that Alternative 3 is real, and that the show was part of the world government's vast and sinister disinformation scheme. They argue that by making Alternative 3 appear to be a fanciful hoax, the world government has insured that no one will suspect that it is, in fact, the frightening truth. Keith, Jim. (2005). Mind Control and UFOs: Casebook on Alternative 3. Adventures Unlimited Press. "Since its initial airing, the startling claims of Alternative 3 have been debated and decried as a hoax, while others claim that there is truth to this terrifying plan of our secret rulers! Drawing on his diverse research and a wide variety of sources, Jim Keith delves into the bizarre story behind Alternative 3." Brian Eno's great 1978 album "Music for Films" had a track called "Alternative 3." Now I know why!